Antia says Belaga folk have been catching fish way before Bakun Dam was built. BELAGA: Fishing complements the livelihood of the people here who also plant paddy, oil palms and vegetables. Local oil palm planter Antia Sai would set out for Sungai Linau at Bakun Reservoir at 4pm and be home by 11pm every Tuesday and Friday. During each trip, she would lay some 30 drift nets vertically in the river, each measuring 30 feet long. “Currently, we are only selling our catch at Bakun wharf every Wednesday and Saturday morning,” she told BAT 7 when met yesterday. Besides Sungai Linau, Bakun reservoir encompasses Batang Balui, Sungai Murum, Sungai Pelepeh and Sungai Bahau. The types of fish caught there are the ‘mengalan’, ‘baung’, ‘labang’, ‘tengadak’ and ‘empurau’. “We have been catching fish even before Bakun Dam was built. Somehow the fish seems bigger after the existence of the reservoir. The bigger the fish, the more tasty its meat. The preferred size is at least 1 kg,” said Antia, adding that the size of the fish in Bakun is what brings people from places such as Miri, Bintulu and Kuching. According to her, the majority of her customers are middlemen and restaurant owners, identified by their four-wheel drive vehicles (4WDs) loaded with cooler boxes. 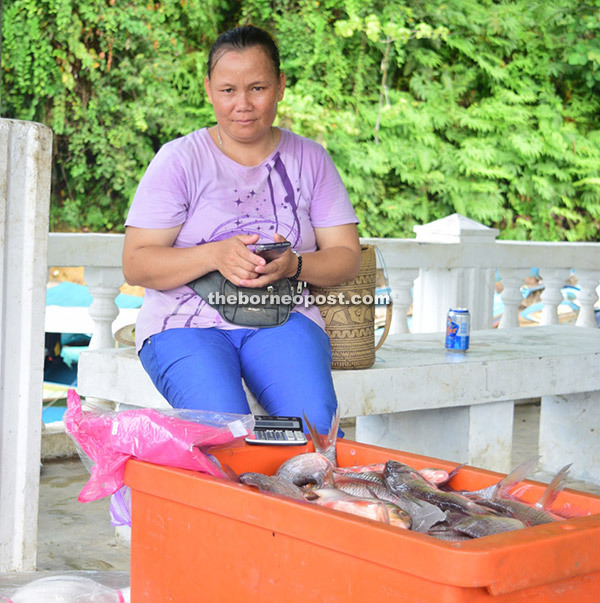 “I want to sell my catch in Bintulu or Miri where they are selling three to four times more than here. For instance, ‘mengalan’ is RM6 per kg here but in Miri you can find traders hiking the price to RM25 per kg,” she said. Antia said without transport, she can only sell her catch at Bakun wharf. “I hope we get a proper market to sell our catch from,” she said. Enta Ului shared with BAT 7 the different fishing methods used by locals. “Every method depends on the kind of fish a fisherman sets out to catch. Today, I’m selling ‘baung’ – a type of catfish. I use dozens of fishing poles to catch them,” the paddy farmer shared, adding that she would start selling her catch as early as 6am. Her haul, on average, weighs 30kg which she sells at RM15 per kg. “If I couldn’t finish selling, I would take some to cook for my family,” she said. Bakun reservoir has a surface area of 695 sq km which is about the size of Singapore. Traders at Bakun wharf sell their catch from early morning to noon every Wednesday and Saturday.